It's every Penguins fan right to react harshly when their favorite hockey team loses; it's part of the beauty of being a fan. We celebrate after wins, we wallow after loses. But some of us start blogs so we have a place to rant beyond what Facebook and Twitter will allow us to. My buddy Cory from TRBB said this last night, but I think that's nearly every hockey fan. In this case, I don't intend to rant, but rather inquire. Since I'm on full-time daddy duties all week I don't have the luxury of being able to watch every part of every game, unless I wanted to record it and watch it back. I might have done that a few years ago, but things just ain't the same no mo. Though I was able to catch much of the early power play moments on my Galaxy Note II thanks to the NHL GameCenter app. Which, incidently, is much improved from last years version. It's like having a 32" TV in your hand! Not really, but it's big. Nevertheless, what I caught was one of the poorest attempts at a man advantage in a while. Not only that, but just down right poor hockey execution. I made the statement after watching the rest of the 2nd and 3rd periods that Crosby looked lethargic. I received a plethora of replies indicating the whole team looked that way, which was accurate. But my point was that 87 tends not to be that way, despite a lowly team effort. 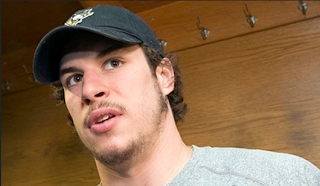 Some are saying Geno is looking more like the anti-MVP thus far. Others are pointing fingers at Bylsma for shuffling the lines like a deck of cards every shift (raises hand). Many are indicating the defensive woes brought on by a lack of toughness and puck management. I know it's early, but we all have an opinion on the matter. So what is it? What's the real reason the Pens looked so hot in games 1 and 2 but so not in games 3 through 5? There is a lot of frustration flying around the Pens' fan base and it's easy to say, "Hey, Shero! We need a trade RIGHT NOW!" Although he may be on the edge of consideration, I don't think it's necessary at this time. The Pens have WAY too much talent on the ice and just haven't been able to gel. Why? Well maybe the constant shuffling of lines HCDB does game in and game out. How does anyone expect chemistry to happen when you have different linemates every two seconds. I hope the Pens figure it out soon because time is a' wastin'. Also if DB wants to shuffle lines, why not put the Kunitz-Malkin-Neal line back together? Surely it's too early to really make major adjustments. I think a key factor would be to get the lines figured out asap, and allow the key players (leaders) to offer some input. You get the feeling that the players aren't repsonding to the adjustments for a reason, because they don't believe in them.